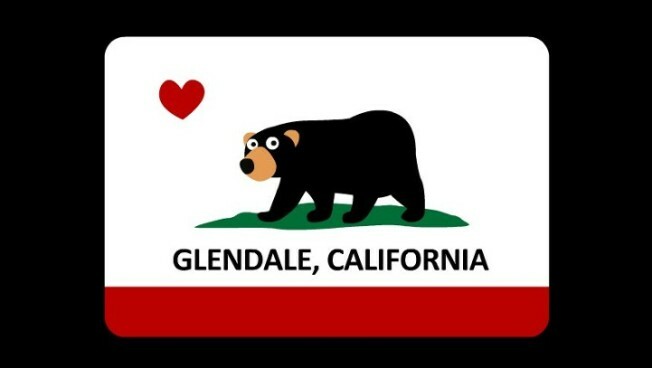 Following the exploits of the Glendale bear? You can lend support, too. Buy a Glendale Bear t-shirt and help Meatball in his new sanctuary-based life. Fame-seeking newcomers arrive in Southern California every day, by the planeload. But few have achieved the instant notoriety of Meatball, the black bear that has repeatedly ambled in our human environs 'round about Glendale and was again captured in August. He's got a few nicknames and handles, like any truly famous celebrity (Meatball, GlenBearian, and the Glendale Bear are all in play), and he's on Twitter, naturally. There are also people out there who love the ursine tourist and hope he lands in a long-term situation where the living'll be good and the food he was seeking on the streets of Glendale'll flow freely. With that in mind, a good-hearted site has sprung up, purveying in Glendale Bear T-shirts and buttons. Two things to note: They pay tribute in a lighthearted way to our state flag, so that's pretty fun, and proceeds will help the Glendale Bear's journey toward sanctuary. The XLs went fast -- these things are popular -- but a note on the site says more shirts are due in a matter of days. If you've been following Meatball's exploits, you know there was a recent tangle in moving him from his current location in San Diego to a Colorado animal sanctuary (Colorado has regulations about housing wild bears). Best keep an eye on NBC LA or the bear's own Twitter feed to find out the latest. While you await more news, why not buy a tee, show some Golden State/Glendale love, and help a bear out? Meatball, we're behind you. Not literally, of course, you being a brown bear and us keeping a respectful distance, but in spirit, surely. After all, your reigning hashtag is #bearhug. Big awww.